Love lemon or orange or grapefruit! Well those are some really cute soaps. My friend makes soap and I have been wanting to learn how to do it. I'm sure they smell really good! They are very pretty but I like unscented because I have multiple allergies so I just avoid scents when practical. Lisa, as for your question on my post, see https://www.daysoftheyear.com/days/squirrel-appreciation-day/. Just stopping by to say hello - those soaps are pretty! Hope all is going good! Theses soaps are great. They will make an amazing gift. They are gorgeous! And great detail. If I win, I will set them out as Valentine decorations. You make just gorgeous soaps! Those are beautiful. They look like Wedgewood's Jasparware pendants. These are so pretty! I like lavender because of the relaxing effect. I really enjoyed the soaps I used of yours before. They are so beautiful, and its so wonderful you have this fun hobby! prachtig gemaakt dat zijn mooie cadeautjes. Those are adorable! I'd probably put a glass dome over it and save it. I'm allergic to almost all fragrances. I was just looking at soap molds today. Of course the ones I was looking at were of pigs - not pretty hearts. You did a great job!! Hooray! I have been wanting to follow you on facebook and now I am! I'm a new follower----thank you for posting about these and doing a giveaway; have not heard of them but I love any and all soaps...and wow, they certainly are pretty soaps...but yes, will definitely use them! Found you from Tight Wad In Utah. Your soaps are beautiful. Fingers Crossed. It would be lovely to sit them out in Feb in my guest bath. So elegant! Thank You! Thanks for the chance! :) I love natural soaps, the scents are just wonderful. Lavender is a favorite, lemon/citrus is good too. My favorite scents are grapefruit, watermelon, and cinnamon. 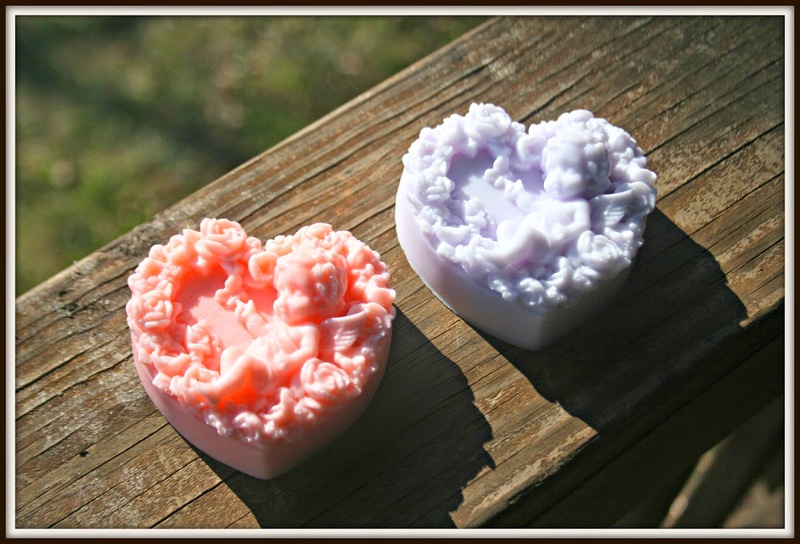 Those valentine soaps are so cute....love them! I love scented home soaps. Especially ones that are as cute as these.